Coconut oil deodorant?!? Yes, you did read it correctly…you can use coconut oil in place of deodorant! I’ve heard mixed results about this, but it’s been working for me for about 7 months now. Summer’s fast approaching, so I’ll update this at some point and let you know if I’m able to use my coconut oil deodorant during the summer with the same great results or not. For women, I recommend making sure armpits are clean and well-shaved. Then apply a liberal, but thin layer of coconut oil, just as you would regular deodorant – but rub it in a little more. It absorbs into the skin quickly if rubbed in, but takes longer if you don’t rub it in. I find it easiest to apply when the coconut oil is at a solid state. Please, please, please keep the coconut oil you designate for deodorant separate from the coconut oil you use for cooking! Need I say more? As with any product, never put something on your body that you wouldn’t eat. So opt for high quality, organic coconut oil, like Omega. You can get great little glass jars like this one, on Amazon or repurpose an old glass jar of some sort for your deodorant. If you’re adding essential oils, make sure to use a dark colored glass jar to keep the integrity of the essential oils. Add essential oils for extra odor protection or for a lovely smell. Lavender, tea tree (melaleuca), frankincense or roman chamomile are fantastic options. However, always use super high quality (therapeutic grade) essential oils. The coconut oil will need to be at room temp (liquid) in order to mix in the essential oils and you only need a few drops. Use a glass stirring rod, like the one below, or improvise with a stainless steel utensil or straw. 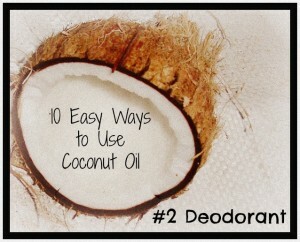 Quick note about using coconut oil for as a natural deodorant. Coconut oil is not an anti-persperant, so it will not keep you from sweating. I recommend trying it on a colder month so you can get an idea if it works for you as a deodorant and see how you like using it. I first tried in on a rather strenuous and much too hot week in September…and I was surprisingly pleased with the results….not to mention that my pits were buttery soft and had less razor burn. It does however take some getting used to not using traditional deodorant with a built in antiperspirant. To be honest I expected coconut oil deodorant to NOT work, but found that it has worked better than any natural option that I’ve tried. Even after a round at the gym, I smelled fine. But do know, that coconut oil as deodorant may not work for everyone and it does take time to pull away and adjust to a lifetime of using conventional deodorants. This entry was posted in Coconut Oil, Natural & Organic Beauty Products and tagged coconut oil, coconut oil deodorant, natural deodorant by gree8956. Bookmark the permalink.